Roll up the 16 hot dog sausages inside the puff pastry, then chop each one into thirds. 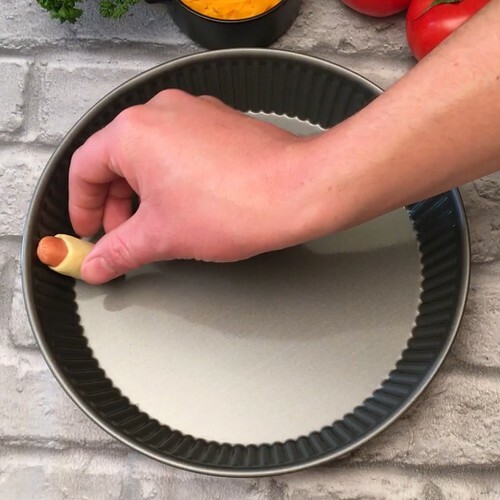 Place the wrapped hot dog pieces on their ends inside an oven-proof pie dish, creating a double layer all around the outside. Place the crème fraîche in an oven proof bowl, and place it in the pie dish in the middle. Add the grated cheese into the cream and mix. Bake in the oven at 210°C FOR 20 minutes, then serve by dipping the hot dogs in the cheese mixture.